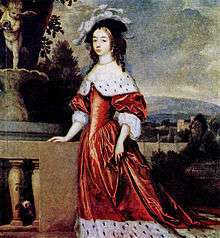 Henriette Catherine of Nassau (10 February 1637 – 3 November 1708) was a daughter of Frederick Henry, Prince of Orange and his wife Amalia of Solms-Braunfels. Henriette was a member of the House of Orange-Nassau (Netherlands). Henriette was born in The Hague and was the seventh of nine children born to her parents. Some of her siblings died in childhood. Henriette and four other siblings lived to adulthood, her surviving siblings were: William II, Prince of Orange, Luise Henriette of Nassau, Albertine Agnes of Nassau and Maria of Nassau. Henriette's paternal grandparents were William the Silent and his fourth wife Louise de Coligny. Henriette's grandfather, William was murdered on the orders of Philip II of Spain who believed that William had betrayed the Spanish king and the Roman Catholic religion. Henriette's maternal grandparents were Johan Albrecht I of Solms-Braunfels and his wife Agnes of Sayn-Wittgenstein. Amalie Ludovika (b. Berlin, 7 September 1660 - d. Dessau, 12 November 1660). Henriette Amalie (b. Cölln an der Spree, 4 January 1662 - d. Cölln an der Spree, 28 January 1662). Frederick Casimir, Hereditary Prince of Anhalt-Dessau (b. Cölln an der Spree, 8 November 1663 - d. Cölln an der Spree, 27 May 1665). Elisabeth Albertine (b. Cölln an der Spree, 1 May 1665 - d. Dessau, 5 October 1706), Abbess of Herford (1680–1686); married on 30 March 1686 to Henry of Saxe-Weissenfels, Count of Barby. Henriette Amalie (b. Kleve, 26 August 1666 - d. Oranienstein an der Lahn, 18 April 1726), married on 26 November 1683 to Henry Casimir II, Prince of Nassau-Dietz. Louise Sophie (b. Dessau, 15 September 1667 - d. Dessau, 18 April 1678). Marie Eleonore (b. Dessau, 14 March 1671 - d. Dessau, 18 May 1756), married on 3 September 1687 to Prince Jerzy Radziwiłł, Duke of Olyka. Henriette Agnes (b. Dessau, 9 September 1674 - d. Dessau, 18 January 1729). Leopold I, Prince of Anhalt-Dessau (b. Dessau, 3 July 1676 - d. Dessau, 9 April 1747). Johanna Charlotte (Dessau, 6 April 1682 - d. Herford, 31 March 1750), Abbess of Herford (1729–1750); married on 25 January 1699 to Philip William, Margrave of Brandenburg-Schwedt. Henriette and John George were a great influence over the German court at agriculture, construction of ports, levees, architecture and painting. In 1660, John George gave his wife the town of Nischwitz where she built houses, a cemetery, made glass and brought it to fruition. John George died in Berlin 1693. Their son, Leopold was still only a minor so Henriette resumed regency for his son until he came of age. It is speculated that Princess Catharina-Amalia of the Netherlands (granddaughter of Beatrix of the Netherlands) received the name Catharina after Henriette Catherine. Wikimedia Commons has media related to Henriette Catherine of Nassau.